Experiments on fracture and structural transformations caused in solid and fluid media as well as in conductors and dielectrics by an intensive pulse action of the ambient medium or by directed energy fluxes reveal several effects showing that dynamic fracture (breakdown) of materials substantially differs from similar processes under slow quasistatic actions. For example, one of the main problems in modeling the dynamic strength properties of materials is related to the dependence of the limit characteristics on the loading history and methods. The dependence on the method of force application manifests itself as a large (hundreds to thousands percent) variation in the limit variables caused by variations in the action duration, amplitude, increase rate of the external action, and several other factors. While the critical value in statics can be treated as a material constant (or a quantity varying relatively slowly, at most, within several dozens percent), the experimentally determined values of the critical characteristics in dynamics are characterized by very strong instability and can differ by orders of magnitude. As a result, the dynamic behavior of a system whose description is based on these characteristics turns out to be unpredictable. This and some other specific features of material behavior under pulse actions are common for a series of seemingly quite different physical processes such as pulse fracture of solids, cavitation in fluids, dielectric discharge and breakdown, and phase transitions under temperature and mechanical actions of shock waves. In the present paper, we consider examples illustrating typical dynamic effects in the abovementioned processes. 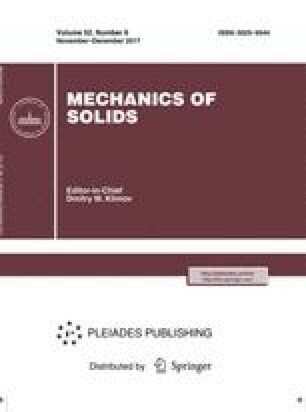 We give a unified interpretation of fracture of solids and fluids, dielectric breakdown, and dynamic phase transitions using the structural-temporal approach [1–3] based on the notion of fracture incubation time. Original Russian Text © Yu. V. Petrov, 2007, published in Izvestiya Akademii Nauk. Mekhanika Tverdogo Tela, 2007, No. 5, pp. 40–48. Publisher Name Allerton Press, Inc.